Hanging bridges are a unique way of discovering the hidden secrets of Arenal volcano area, as you walk right into the jungle throughout a two-mile circuit. A naturalist guide will accompany you and point out animal and plant species along the way. You will also see some of the most stunning vistas of the Arenal Volcano. 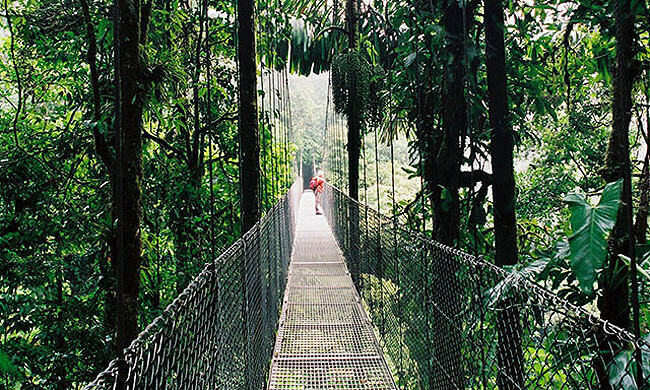 The Arenal rainforest hanging bridges are located in a 250-hectare reserve of primary forest. This is a great tour for anyone wishing to get up close and personal with the native flora and fauna of the rainforest! Your fun begins when you are picked up from your hotel and driven 30 minutes to the entrance of the hanging bridges. The two-mile trail loops you through the mountainous area and into the rainforest. 16 state-of-the-art bridges introduce you to the forest’s rich biodiversity. Ten of the bridges are static bridges, and the other six are hanging bridges. The length of the bridges range between 72 and 320 feet long. The forest is home to many animals and birds like howler monkeys, poison dart frogs, red frogs, snakes, toucans, and parrots. This is a fun and informative 2.5-hour walk that allows you to have close contact with the surrounding nature and learn more about the primary forest! Once you have completed the two-mile loop, you will be driven back to your hotel. Tour includes: Transportation from/to your hotel, park entrance fee, bilingual naturalist guide. What to bring: Comfortable clothes, hiking shoes or sneakers (required), camera, sunscreen, rain jacket, insect repellent.